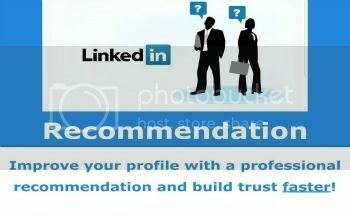 I will post a recommendation (provided by you) on your LinkedIn profile. If you want me to write the recommendation, or want faster delivery, please check out the extras below. If we have been in the SEO game for quite a while. Recommendations and Endorsements are vital to increasing your profile strength, profile views, building credibility, and making your profile more professional. This recommendation will come from an active account, NOT a ghost account, located in the United States, with 500+ connections, and used daily. It's our attention to detail that makes the difference. You are among the first to receive this special offer. Our rates may be a little higher than some, but in the long run we save you money. All our work is backed up by our ironclad guarantee. Don't delay! Order This gig TODAY !! !